Growing up in rural Michigan, artist Beth Roy acquired the foundation which allows her paintings to come to life today. She began riding horses at an early age and her life-long relationship with them has allowed her to translate them beautifully. Body language is a critical component of her compositions. She has been able to capture the personality of animals and people in many of her works. Her professional art schooling was obtained at Austin Peay State College, in 1986-87 and at Christopher Newport College in 1989. 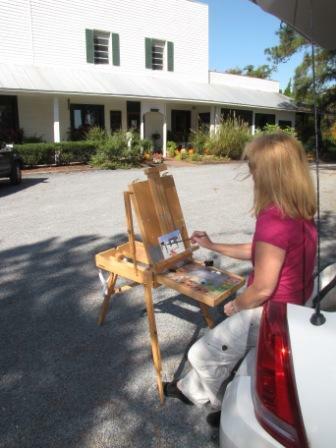 Her works are currently represented in Beaufort and Southern Pines, NC. After painting in watercolor for 15 years, Beth changed to oils in 2002 for the permanency. In 2006 Beth was awarded an Honorable Mention for oils in the ACMC Festival and then in 2008 was awarded 1st place in oils at the Festival for the large landscape “Water Lilies. In 2009 she was awarded Best in Show at the juried Artist League of the Sandhills Pot of Gold Show. In 2015 Beth created a pottery studio in her garage which allows her to make stoneware and raku pottery as a relaxing "hobby". After many years of showing horses Beth accepted the formidable position of Volunteer Coordinator for Carolina Horse Park. She also co-organizes Running Start Horse Trial and Carolina Derby Cross. Beth and her husband Tom live on their farm in Vass, NC with 3 horses, 2 cats and a dog. Other pastimes are mountain biking, yoga, Jazzercise, reading, cooking, and spending time with friends and family.